Have a wonderful family at home including four beautiful children. Graduated from Roadmaster Driver School of Trucking back in 03/2017. Currently hold Class A & M along with my X - Hazmat/Tanker endorsement. Been in all areas the automotive industry industry my whole career including service technician, service writer, parts, new & pre-owned vehicle sales, and finance & insurance. Looking for a change, thus why I went and obtained my CDL and am excited for a new opportunity. Yepper. He made it known he needed to fill the afternoon into the evening shift. Said he does best to get your 34 hour done over the weekend. Said he couldn't promoise every Sat and Sun off as there is weekend work at times but if you work weekend, you get rate and a half pay. He was very up front of what he needed. Good morning all, been a viewer of this site for a couple years. Only my second post though. Looking for feedback on a company called W.W. Transport. Long story in short, graduated from truck driving school 3/2017. Started as a driver trainee with a carrier out of school, unfortunately it was short lived, only about 2 weeks. I have four little ones at home who were having a hard time adusting to me being gone OTR. So, I hung it up and got back into the automotive and diesel field as a tech which I've been for about 20 years now. After recently facing some downsizing and salary cuts, I've decided to leave and pick up where I left off with driving truck. Last week I applied for a local home daily position with W.W. Transport out of North East PA driving pneumatic tank hauling flour. Honestly, I didn't think I was going to hear back as I have only 1 week of training under my belt and most local companies want at least the magic "1 year" number. Well, to my surprise, the terminal manager called me in for an interview yesterday morning. After speaking with him for a while, I was totally up front about my training and experience, he said because since its been a couple years since I last drove, he would like me to go for a road test. So he called a veteran driver up to take me out for a bit to get an idea where I'm at. I hopped in and for the most part, it'll came right back to me. As I started out in first, I made my way up a few gears while going through the yard to find an empty tank to hook up to. Once we found once, I spun around, backed up and connected to the tank. Hooked up my air lines and my electrical, verified the kingpin locked into place, then cranked up the landing gear and off we went. I made my way up to 10th gear while double clutching and made my way back down to first while only grinding on 2 gears on the way down, but I simply recovered my current gear, tried again, and she slid right in. When we got back to the yard, the driver said "Ok, I'm hopping out, go ahead and put it back in the hole where you got it." I started backing slowly, but went slightly crooked. He said to stop and asked me what I thought I did wrong. Told him I became fixated on only one mirror. He agreed. I pulled up and tried a second time this time scanning both mirrors and got it right in. The driver said I did great for only having 4 weeks of schooling, 1 week of training and being out of it for 2 years. We went back into the office where he told the terminal manager how I did. The terminal manager he would like to hire me on as a local home daily driver! He said for the first two weeks, he's going to keep me very close to the yard as a jockey/shuttle just moving trucks and tanks to the wash center, garage, to the terminal etc. just so I can get back into the groove of driving, shifting, backing etc. After those two weeks, he said I'll be going out with a driver for a week or two to learn how to properly load and unload the tank. After that, I'll be heading out on my own. New Driving Looking Local Home Daily. Options? Hi everyone. My name is Joe. I'm new to the trucking world. I obtained my Class A along with my Hazmat/Tanker endorsement back in 3/2017. 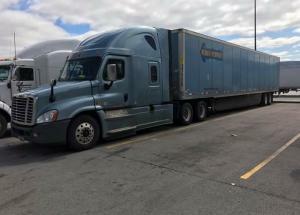 Upon graduation from Trucking school, I began with an OTR carrier. Unfortunately, it was short lived, only a couple weeks. Problem was I have four little ones at home between 6 months and 9 years old and they were having a hard time adjusting to me being gone for such long periods, as was I too. So I hung it up and got back into the automotive field which I've done my entire career. I want to get back into trucking because I want something new and exciting. I enjoy being out on the road. I would like to find something local home nightly so as I can be with the kids. I know as a rookie driver, you usually have to have anywhere from 3 months to a year under your belt before most carriers will consider you. My question is are there any local companies out there who will take a recent grad?